Sharp Electronics Corporation is a U.S. subsidiary of Osaka-based Sharp Corporation - a company known worldwide for its unique one-of-a-kind electronic products and solutions. Sharp strives to help you create a balance between work and personal time with products that enhance life at work, at home, and everywhere in between. 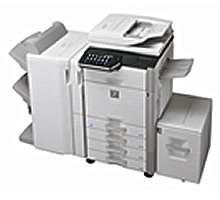 Sharp business products can boost your productivity and reduce costs. Sharp products are designed to help individuals, families, and corporate teams connect effortlessly, communicate clearly, and unleash creativity like never before. Sharp is dedicated to improving people's lives through the use of advanced technology and a commitment to innovation, quality, value, and design. Note: Sharp products are only available at our Arkansas location. Contact us to find out more about our Sharp products.